At the end of a year beset with environmental destruction and divisive political spectacles, we found some collective respite in two internet animal phenoms. First, in early October, a Mandarin duck mysteriously appeared in Central Park, taking Twitter by storm and attracting birdwatching hopefuls across New York City. 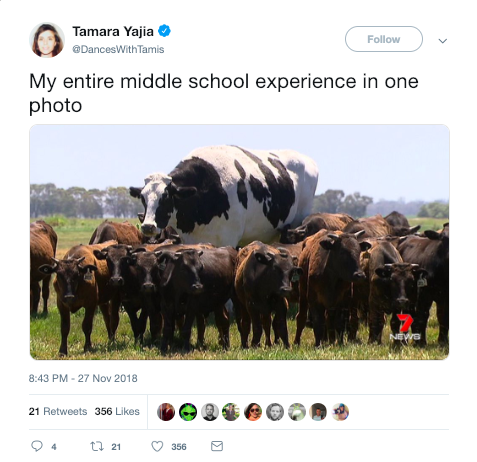 Then, in November, a photo of a very large Australian Holstein steer standing among smaller wagyu cattle caught our cultural imagination and instantly went viral. Relatable tweets, funny memes, and explainer articles ensued. We dubbed the animals “hot duck” and “big cow,” then learned that the latter is not a cow, but in fact a steer named Knickers. We followed along as the duck settled into a new social world, sometimes bullying and nipping at the Central Park mallards but more often coexisting peacefully. We took inspiration from the steer, who was saved from slaughter by his enormous size. Knickers and the Mandarin duck came to represent a multitude of our own feelings about our year and ourselves. The two animals represent opposite poles of our own social food chain. If the Mandarin duck is an aspirational symbol of an individualist who takes pride in his unique hotness and disdains the homogenous masses, the Holstein steer is a relatable underdog, trying to fit in but inevitably standing out. While we admired the duck’s effortless beauty and unaffected attitude, we also empathized with the steer’s conspicuously awkward appearance in a group of much smaller, browner bovines. How do we explain the instant fascination with these two internet sensations? The duck we can chalk up to geographic novelty and mystery. Unaccustomed to the striking jewel-toned plumage of the Mandarin duck, most commonly found in China and Japan, NYC passersby and far-flung internet observers immediately had questions about the duck’s origins and arrival. Ducks aren’t allowed to be kept as pets in the city, and researchers ruled out an escape from a local zoo, so it remains a mystery whether he was dropped off by a disillusioned duck owner or escaped captivity in a neighboring state. The duck represented a displaced, alternate geography, but the steer gave us a glimpse of another possible reality altogether. 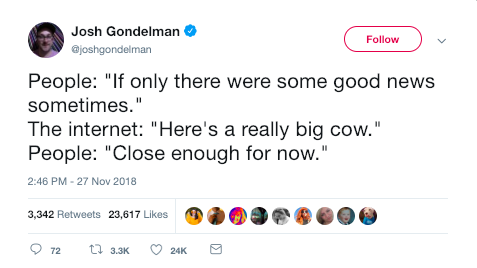 As journalists began explaining why the steer was so big, it became clear that our surprise at Knickers’ size was largely a result of how little we know about the true size of mature cattle. Knickers is big partly because of his genetics and partly because steers (castrated males) of his breed can reach heavier weights than bulls. But the key factor is his age. Knickers is seven years old, and Holstein cattle are typically slaughtered around 15 months, long before they reach their mature size at age four. Knickers is larger than average, but steers of his size are hardly unheard of by those in the industry—they just aren’t usually allowed to live so long. And that’s what makes Knickers truly inspirational. In an environmental crisis intensified by an entrenched, inefficient food system, Knickers beat the system. And in a culture where knowledge about that food system is often sheepishly avoided and ignored, Knickers arrested our attention and showed us what our cattle would look like in an alternate food reality. During this fleeting cultural moment when we related to two animals as friends rather than just food, we glimpsed a world where we would be more curious and knowledgeable about the lives, abilities, and sizes of the animals we farm. And as we head into a new year, that’s a good place to start.